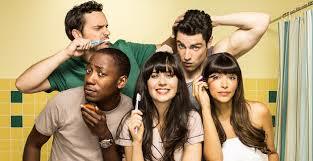 Is “New Girl” the Funniest Show on Television? *Full disclosure: this entire post is about how I think New Girl is the funniest program currently on television. I have not seen Dads, but I imagine that it’s absolutely horrific and not funny at all. Punny, maybe, but not funny. The maybe not so great thing about the title of this post is that it could very well be polarizing for those Zooey Deschanel haters out there (you know who you are. You make up about 88% of the population). People either really love or really hate Zooey, and I’m sure that has affected the willingness for many to give New Girl a fair chance. For the remaining 22% of the population that finds Zooey tolerable (Why not 12%, you ask? Because I always like to give 110%. If we were in person, I’d wink at you right now), you are as obsessed with New Girl as I am, and this is a welcome topic. For the rest of you, just read this and I’m sure you’ll change your minds.